Global demand for rare earths is forecast to increase 3.5 percent per year to 149,500 metric tons in 2019, valued at $4.5 billion. Battery alloys, permanent magnets, and autocatalysts will be the fastest growing end use markets. China will remain the dominant geographic market, while India will grow the fastest. 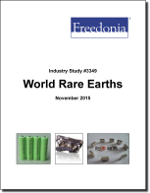 This study analyzes the 125,900 metric ton world rare earths industry. It presents historical demand data (2004, 2009 and 2014) and forecasts (2019 and 2024) by product (e.g., cerium, lanthanum, neodynmium, praseodymium, yttrium) and market (e.g., permanent magnets; glass, polishing, and ceramics; fluid cracking catalysts, metal processing, batter alloys, autocatalysts, phosphors) for six world regions and 13 major countries. The study also considers market environment factors, details industry structure, evaluates company market share, and profiles 30 industry players, including China Northern Rare Earth Group High-Tech, Ganzhou Rare Earth Group, and Aluminum Corporation of China.